Copper has been in use in kitchens for a very long time. Perhaps not so much in Malta, however very popular in Britain and the US, it has now finally made its mark as one of the local designers’ more popular material of choice. From functional accents like sinks and mixers, handles, railings & appliances to touches in soft furnishings like stools, pendants and pots and pans, copper is here to stay. Copper goes well with soft muted colours (think mint and pale blue) but also with bolder, darker colours (charcoal grey, midnight blue, bottle green) and also with white for those after a soft Scandinavian look; think of a mix of white fronts, reclaimed wooden top, subway tiles and copper fronted top cupboards and handles. Copper can be used in small doses for those who aren’t after a daring effect; a copper faucet and sink coupled with bin-pulls say sleek and sophisticated. Copper produces a stunning texture-on-texture effect. Too shy to go with full polished effect? Mix in some highly mirrored copper to a more sombre matt finish and the result is understated elegance. Copper has great anti-bacterial properties as it destroys fungi spores, bacteria and viruses and it is easy to wipe down and maintain – albeit it being prone to showing finger prints- just like stainless steel. Copper scratches and stains easily, acquiring a lovely patina with age. 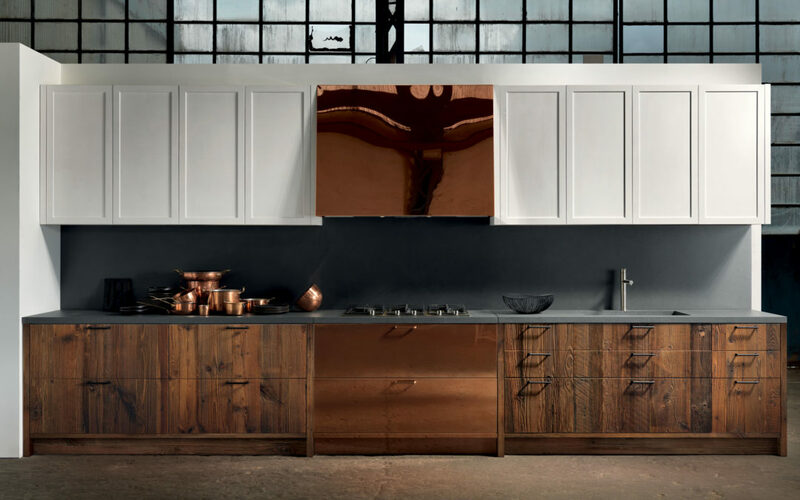 Of course for those who prefer their furniture to remain as when first purchased, the copper Factory fronts by Aster Cucine are great substitutes. These are basically stainless steel doors, sprayed and treated to look like copper; without the disadvantages that comes with the natural soft material. In addition to making a statement, copper is of course a valuable material and can be re-worked into multiple things at the end of its intended use. For example; a copper worktop can be re-made and polished into a backsplash. It can be cut and machined into light fittings, furniture pieces, decorative tiles, accessories or sold off as scrap. In the Factory kitchen above, we can see a very interesting mix of reclaimed wooden fronts, matt copper bases, a shiny copper hood and hand painted panelled doors- anchored beautifully together with the dark anthracite cement top and back splash. The above kitchen is all about raw and industrial. Matt copper is mixed in beautifully with chalkboard top cabinets and dark grey cement top, backsplash, plinth and the very stylish uprights which serve to delineate & sharpen the look. In the composition above, we see how stunning the tone on tone effect can look. The base units are made of a thin framed door with the raised panel in glossy copper and the lower in a lovely matt finish. The hood and top cabinets are in the highly polished copper- with transparent fronts. The Factory kitchen by Aster Cucine is highly customisable and there are absolutely no limits to what you can achieve for a highly personal and authentic kitchen. Visit us at the Brands International showroom to see your own Aster Cucina come to life!